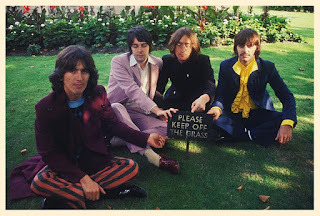 I'm taking it easy today with a fun post showing some photographs that were taken in the Beatles' "Mad Day Out" photo session, which happened fifty years ago today. It was a Sunday, and London, sleepy town that it was on Sundays in 1968, was pretty much closed down. The Beatles were free to go wherever they pleased without attracting much attention. Unlike their previous photo sessions, this one was loose and informal. It didn't actually start out that way; it had actually begun as a regular photo session. 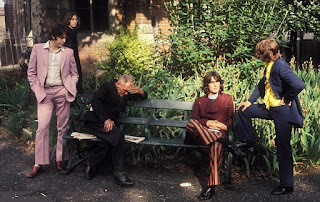 After taking some standard publicity shots of the group for Life magazine in America, photographer Don McCullin of the London Sunday Times suggested they go about London and have their picture wherever they happened to end up, under any circumstances. 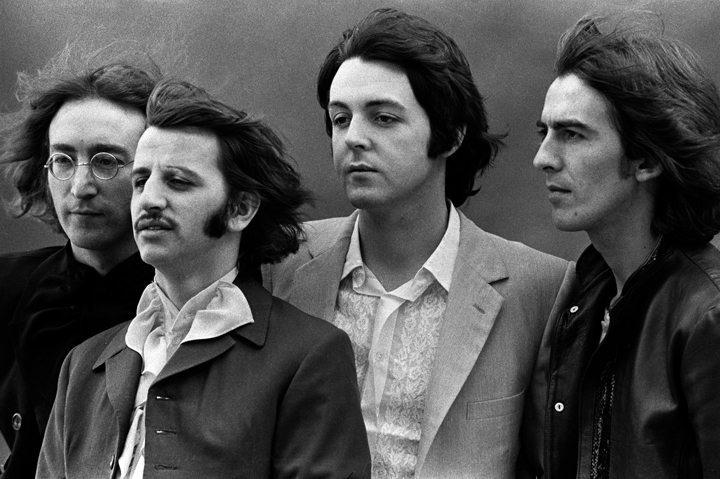 He invited fellow Sunday Times photographer Tom Murray along, but he didn't tell him that he would be photographing the Beatles - which Murray found out only after he arrived at the Sunday Times office and found the group there. 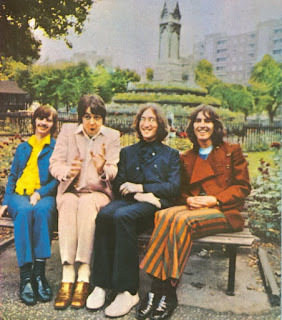 The Beatles, McCullin and Murray went to various locations, including the docks along the Thames River, where Murray thought they'd be reminded of Liverpool at feel at home. One of their more memorable stops on the Mad Day Out was St. Pancras Church, where they posed with the undoubtedly surprised locals. 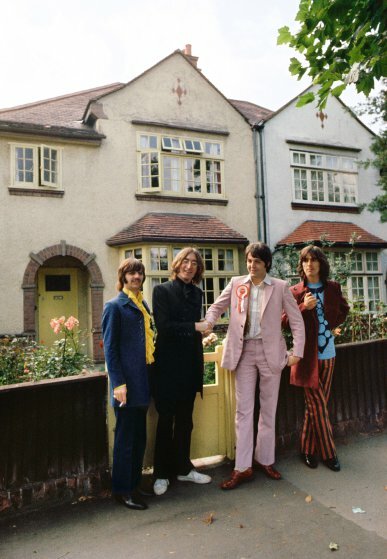 A monochrome picture from this location was used in the gatefold of their 1973 greatest-hits Red and Blue double albums (1962-1966 and 1967-1970). Below is a color photo of that same gathering. 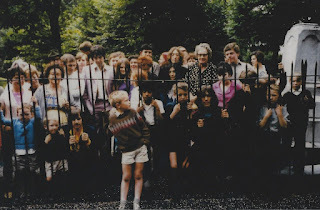 Note Yoko Ono standing directly in front of John Lennon. 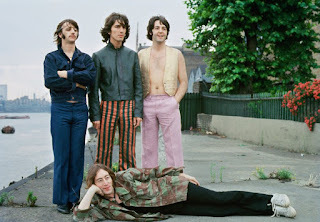 Throughout the session, the Beatles would change clothes, but they mostly posed in the garments seen in the first photo in this blog entry. Ringo Starr, of course, stood out with his yellow ruffled shirt, and George Harrison mostly sported a T-shirt with a picture of a necktie ("Well, for a start, I don't like your tie!") John mostly stuck with a black outfit, while Paul McCartney mostly wore a pink-beige suit and gold shoes. The Beatles also made their way that day to Regent's Park, which happens to almost literally a stone's throw away from Abbey Road Studios. And while the locals at St. Pancras were happy to be part of rock photo history, some folks were just completely oblivious to having the fabulous foursome in their company. Like this chap. The Beatles were clearly having a good time, and may have been more relaxed during this photo session than any other time in 1968 after returning from studying Transcendental Mediation in India. 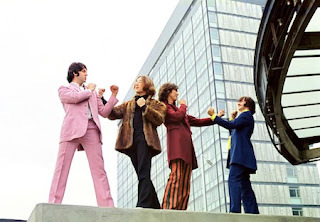 One photo on a concrete island in a London traffic circle shows the group pretending to fight with each other. But given the tensions over the making of the White Album, I wonder how much of it was really playacting! 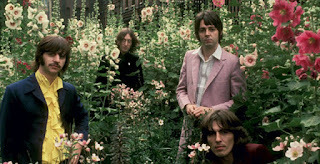 None of these photos were in serious contention for the cover of their double album, although some outtakes made it onto the photo-collage poster that came with the album (more of which later). But the Mad Day Out photos are probably the most memorable pictures taken of the Beatles, as they don't appear stiff or uniformly dressed. They look like the sort of guys you'd come across on the street, just taking things easy and enjoy themselves. 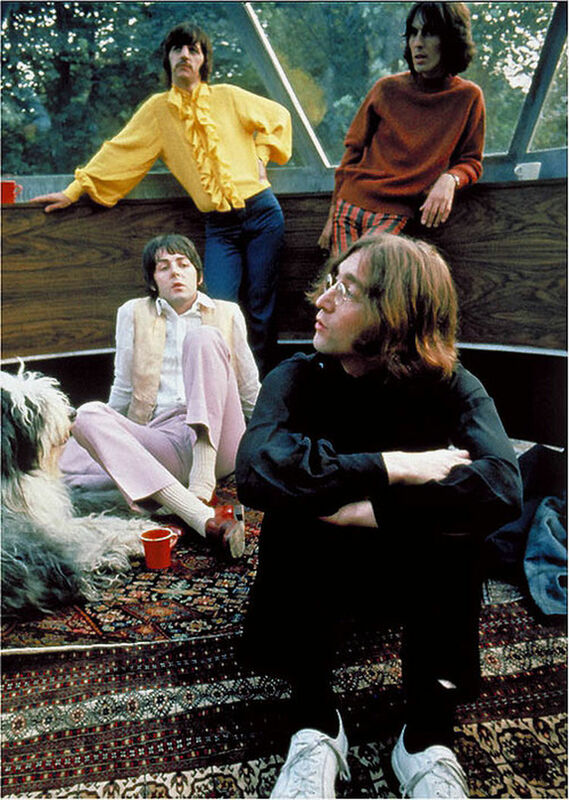 And then it was back to Paul's house on Cavendish Avenue and with his dog. 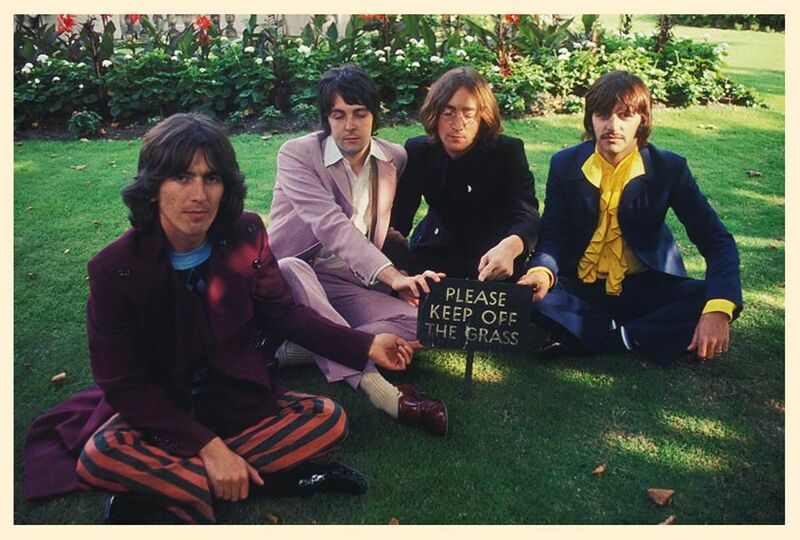 These are only ten of the many pictures from the Mad Day Out photo session, and all you have to do to find more is Google "Beatles Mad Day Out." Even today people who think they've seen all of the photos from this session are bound to find more that they didn't even know existed.